Meiling Bansee, you have probably seen her strewn across your computer screen from Trinidad entertainment websites like Triniscene.com or even this blog. In the post, "Trinidad Carnival 2008 Pictures (from the fetes to the road)", I used her infamous last words, "I Think TT (Trinidad & Tobago) carnival is well worth having to live off of a Crix (crackers) and cheese budget for the rest of the year!" 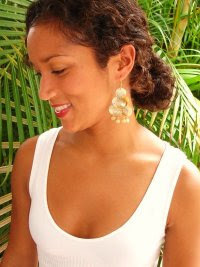 Meiling, like Troy Marshall (the two are friends) never misses a Trinidad Carnival or fete. She too, always jumps with TRIBE Carnival Band. Meiling and I go back a decade. Eleven years ago, we sat in the front row of a Miami Dade College class that we shared. I was even more thrilled, when I discovered that she honeymooned in St.Lucia, about 2 years ago. This marine biologist works for an environmental consulting firm in Martin County, FL. Mostly, she does coral monitoring and assessment, as well as water and sediment sampling when required. Her bachelors is in biological sciences and her masters is in marine biology. In 2006, when Meiling was getting married in Trinidad, she wanted to wear long, pearl chandelier earrings with her wedding dress. She looked online for styles and never found a pair that caught her eye. She discovered an online bead store which sold individual accessories to help her make her own jewelry. She bought swarovski crystals and pearls! However, her grandmother handed her a pearl necklace that her late grandfather left for her to wear with her wedding dress. "Although I really wasn't planning to wear a necklace because I was planning to wear fairly large chandelier earrings, I knew it would mean alot to her if I wore the nekclace. So, instead of wearing the chandelier earrings I had made, I made small slightly understated pearl and swarovski crystal rondelle earrings to not compete with the pearl necklace. The pearl necklace was old and some of the pearls had discolored, so I decided to re-string the necklace, take out the discolored pearls and replace them with swarovski crystal rondelles that I bought online. I studied several wire bending and jewelry stringing videos online, and discovered that jewelry making came naturally to me, and it gave me an outlet to explore my artistic side, while saving money in jewelry purchases! I never leave home without earrings, even when I'm in a baseball cap and flip flops!" she details. ... And the rest is history, Plum Flower Creations by Meiling was born! Meiling makes the jewelry at her dining room table. The pieces are made from shell, with polished glass or semi-precious stone accents. "As a marine biologist, I am naturally drawn to sea elements, like shell. It is amazing how accessories can bring together a look and evoke different emotions in the wearer, as well as the admirer. With that in mind, I decided to create pieces that I hope will lend even more beauty to the person who wears them while also reflecting the spirit and flare of the wearer," she divulges. Although Meiling's work schedule does not permit her to make jewelry design a full time job, she hopes to grow a Plum Flower Creations by Meiling fan base and provide her creations to admirers whenever the time and materials permit. She would like to host a couple of shows throughout the year to display new pieces and to keep her creations fresh and exciting. Currently she is in Puerto Rico for work. ... And as for that dining table, she does not forget to mention, "It's in a state right now, but I still know where everything is! o; My husband is guarding it for me while I am away!" Pieces can also be custom designed upon request. I want her hair!!! I've searched for that color everywhere!